If nothing else, we are certainly known for our underwater photographs. Since we like to have a photo inventory of all of our projects, the camera comes with us wherever we go! Now that we have this website, we love sharing our photos with the public, especially those who don't often get to see what goes on underwater. Occasionally we are contacted by various organizations and publications who would like to use our photos to publish in textbooks, make posters, write articles etc. and we are more than pleased to show some examples below. If you are ever interested in obtaining one of our photographs, feel free to contact us and we would love to accommodate you, we just want to make sure we are given the proper photo credit because after all, we are proud of our work! A recent publication by Mark Fonseca and Amy Uhrin from NOAA Center for Coastal and Fisheries Habitat Research in Beaufort, NC, featured one of our photos of eelgrass as well as a mention of our eelgrass monitoring efforts in New York's estuaries. Not only does this publication discuss the importance of eelgrass to bay scallop fisheries, it fully describes the physiology, ecological importance, status along the US east coast by state, and implications for restoration. The citation is listed below, and a .pdf of the article can be found here. Consequences for the Fishery in the Western Atlantic. Mar. Fish. Rev. 71 (3): 21-33. 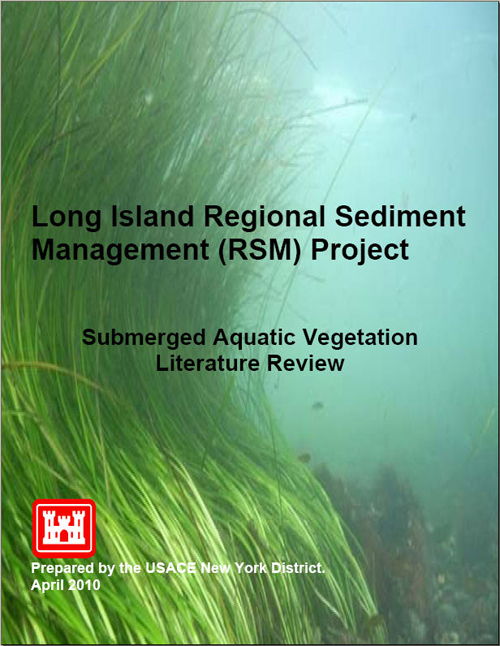 The U.S. Army Corps of Engineers (NY District) used our famous photo of Fisher's Island eelgrass for the cover of their literature review on submerged aquatic vegetation for their SAV Workshop held on April 27, 2010. Scientists from around the region were invited to Stony Brook University for an informal discussion in order for the USACE Study Team to gain insight from their experiences and expertise in order to incorporate SAV knowledge into their Regional Sediment Management Program. 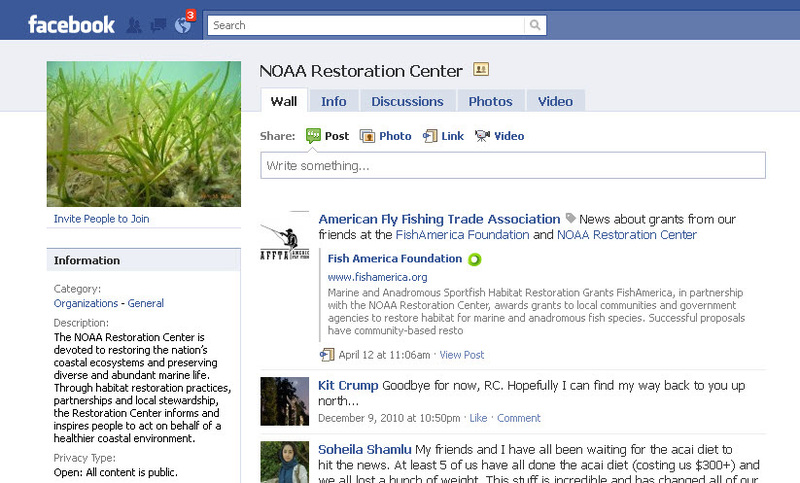 National Fish and Wildlife Foundation has been an important partner in funding for our program. We are always happy to share photos with them, especially of our restoration work in Long Island Sound. 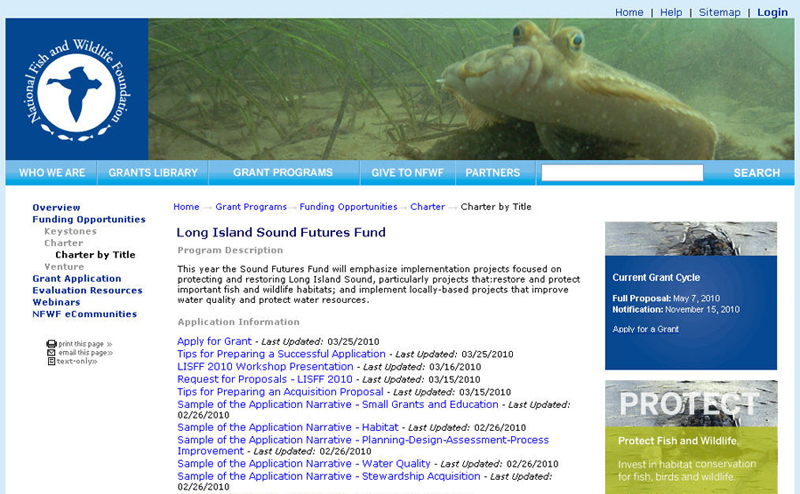 This photo of a winter flounder in our restored eelgrass meadow is now being used as a banner on their website on their Long Island Sound Future's Fund page. 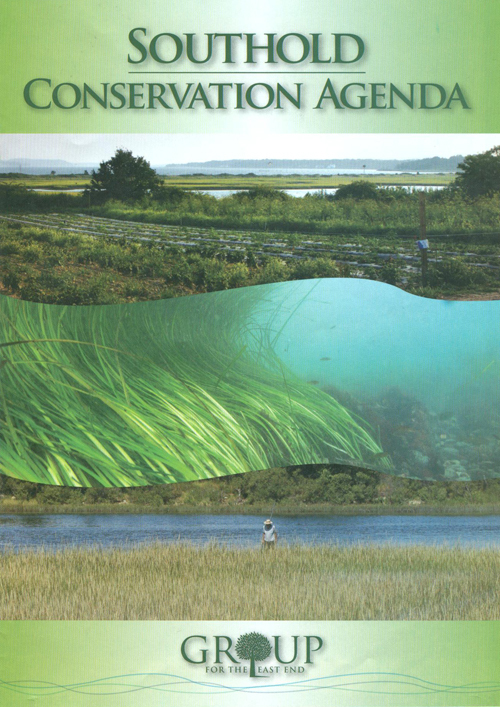 The Southold Town Conservation Agenda was just released on March 12, 2010 by the Group for the East End. It was also included with the March 18th issue of The Suffolk Times. This 15 page handout was designed to "assist residents, school groups and local government to explore the connections between the natural world, public policy and personal practices". It features large fold-out mapsdepicting the Town's natural resources including eelgrass acrage (which was deliniated by our very own Steve Schott). The cover features one of our most well-known shots of Fishers Island eelgrass. For more on this organization, visit their website http://www.eastendenvironment.org/. Science News published an article titled "Botanical Whales" in their December 5, 2009 Edition. The article describes the importance of seagrasses, how they evolved to live in saltwater, and how they are declining worldwide. 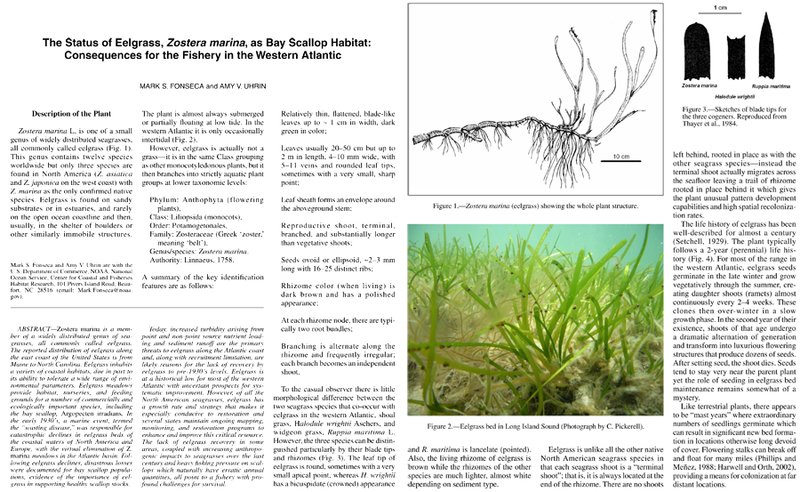 There are also excerps from top seagrass scientists around the country (whom we happen to know very well). Three of our photos were used, including the bay scallop in eelgrass closeup by Kim Petersen Manzo, the lined seahorse in eelgrass photo by Chris Pickerell and the Fisher's Island eelgrass photo by Chris Pickerell. To see the full article, visit http://www.sciencenews.org/view/feature/id/49764/title/Botanical_Whale. The March 2009 issue of Northeast Boating Magazine featured an article titled "Troubled Pastures: The Fight to Save Eelgrass", which included many of our photos and information on our restoration program as well as other programs around the northeast. Photos included shots of Steve Schott collecting eelgrass for restoration, wave-swept eelgrass from Long Island Sound, Winter Flounder in eelgrass, and many others. Unfortunately, the December '09 issue of Northeast Boating Magazine was its last; it didn't survive the tough economic times. Click Here to read a PDF of the article. 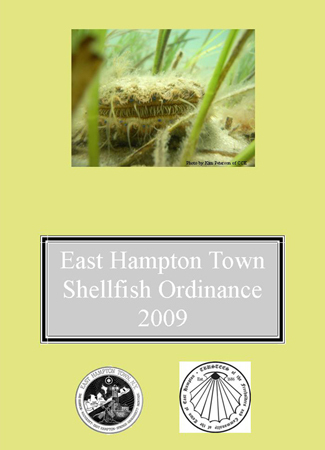 The Town of East Hampton used one of our photos of a bay scallop in eelgrass on the cover of their 2009 Shellfish Ordinance. Photo by Kim Petersen Manzo. The town has also used several of our photos for creating their Eelgrass Habitat signs that notify people of the importance of eelgrass. For more info, visit their website http://www.town.east-hampton.ny.us/index.cfm. 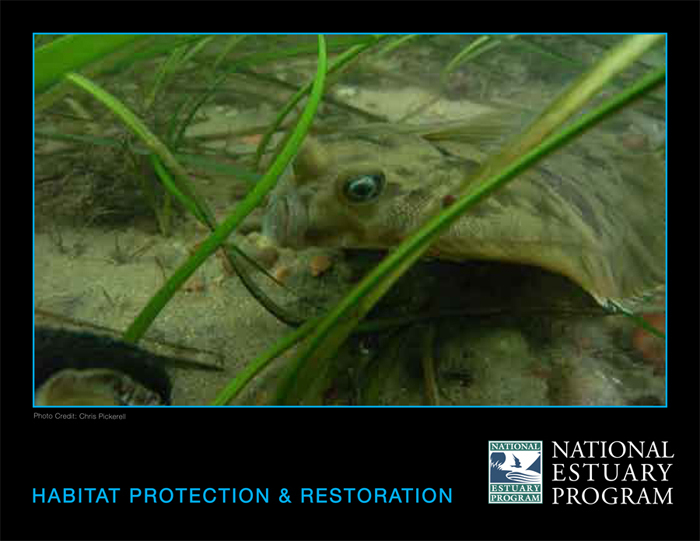 The National Estuary Program (NEP) recently used a photo taken by Chris Pickerell at our St. Thomas Point (Long Island Sound) Restoration Site of a winter flounder for their NEP Habitat Protection & Restoration 2008 publication. 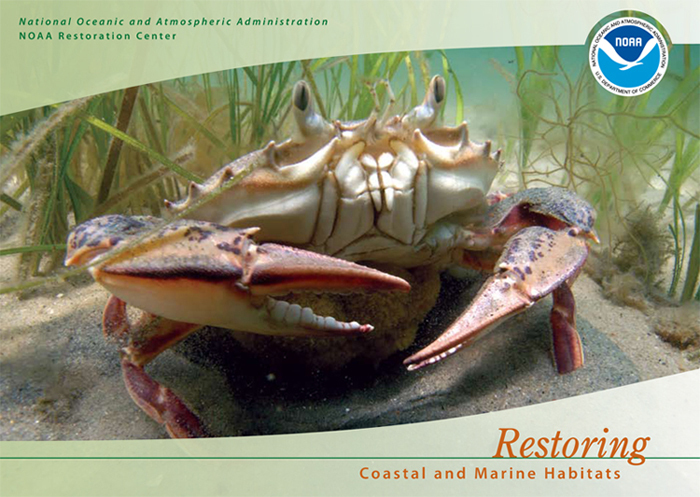 This photo of a lady crab was chosen by NOAA for the cover of their 2007 Restoration Center Brochure. It was taken by Kim Petersen at our Cornelius Point eelgrass restoration site. If you look really closely, she was gravid (pregnant). 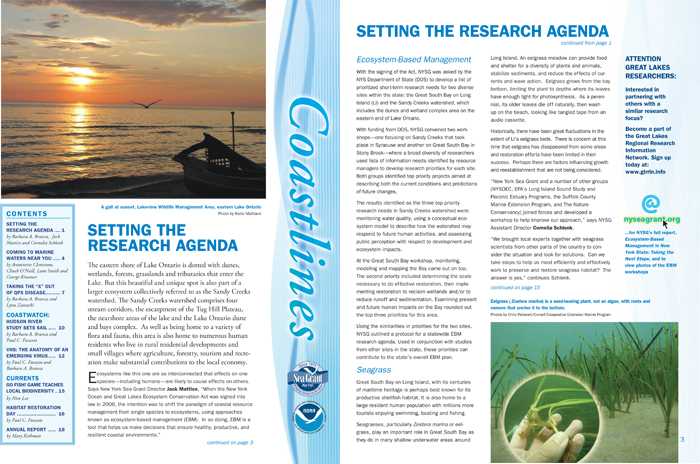 New York Sea Grant's feature article in their Fall '07 publication Coastlines was titled "Setting the Research Agenda", and spoke of Ecosystem-based management and how this is being applied to seagrass habitats. The eelgrass photos were taken by Chris Pickerell. To view the full article on New York Seagrant's website, click here: http://www.seagrant.sunysb.edu/Images/Uploads/PDFs/CL-Fall07.pdf.